Here's a sure-fire way to make your work lunch healthier! As a pregnant working woman, finding the time to prepare healthy meals to bring to work can be very challenging. Sometimes it's tempting and easier to order takeout and get fastfood than make your own meals. But because you need to be conscious about what you put in your body, you really have to make an effort to craft quick, easy and delicious meals everyday. Sandwiches, finger food, salads and soups can be great options. You can also make your lunch and afternoon treats healthier and more interesting by using a variety of fresh ingredients like Arla Cheesy Spread. Real cheese like Arla Cheesy Spread is made from almost 90% fresh cow's milk. It is packed with Calcium and Vitamin A - great for a pregnant woman's body! Here are a couple of easy recipes and packing ideas to help you maintain a healthy body and give your unborn baby the essential nutrients he needs. 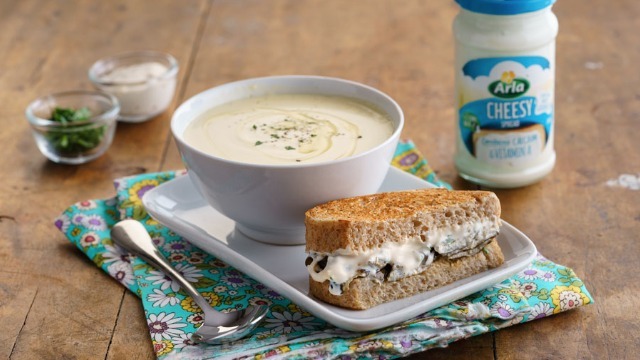 Now to beat the midweek stress at work, try out this delicious and creamy potato soup! You can have it with buttered wheat bread, garlic toast or some crackers. You can serve this in jars and store in the fridge until you are about to go to work. You can top it with chopped scallions and more cheese before heating in the microwave. This creamy and cheesy soupd is also perfect with homemade garlic bread you can make ahead of time. Here's a nice way to serve eggplant and cheese. Eggplants are a great source of dietary fiber and vitamin B1. 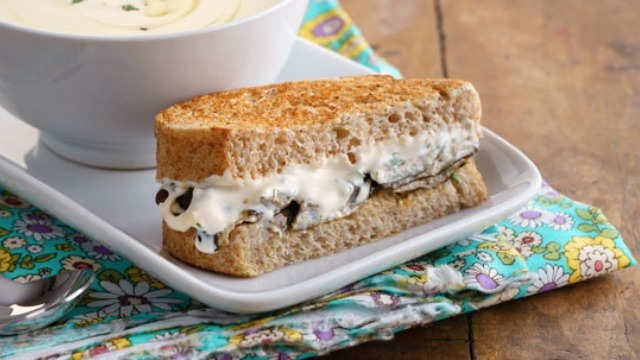 You can serve your sandwich by cutting it into bite-size pieces and putting toothpicks through each slice to keep the eggplant and cheese in place. Then wrap it in foil and store in a mirowavable container. Here's a nice twist to your usual chicken salad - turn it into a spread! Just add Arla Cheesy Spread, which is rich in calcium and protein. This will go perfectly with some fresh fruit juice and tomato soup. You can also melt the cheese in the oven or the microwave first before topping with another piece of bread. 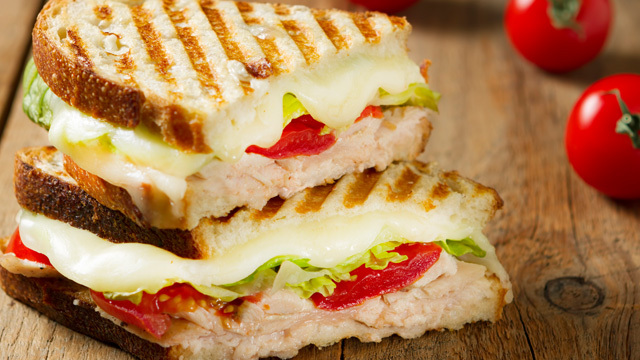 To serve your sandwich, you can slice it into bite size pieces - using a parchment paper, wrap the sliced sandwich and tie using paper twine. You can put in a brown paper lunch bag or use a microwavable container. You can also make a mason jar salad using leafy greens, light dressing ans cherry tomatoes. 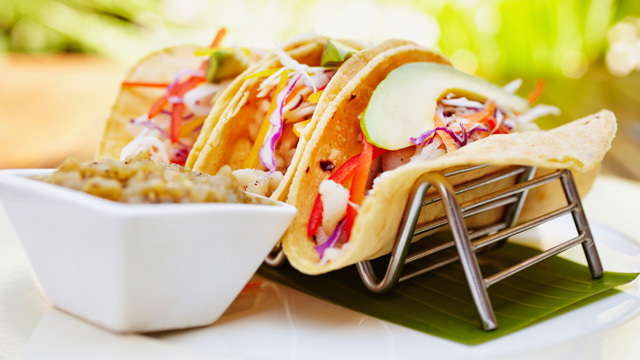 If you're a taco lover, here's a nice healthy twist to this savory treat. You can make this in under 10 minutes and it's a perfect snack after a series of meetings or paperwork in the office. You can wrap the tacos in foil and bring extra lime wedges and cheese that you can sprinkle on top before eating.